A gauntlet-throwing biography of the 18th-century minister and theologian who’s in the pantheon of great American intellectuals, along with Thomas Jefferson, W.E.B. DuBois, and the James brothers. Gura (American/Religious Studies/Univ. of North Carolina; A Glimpse of Sion’s Glory, 1983, etc.) re-creates Edwards’s life and times, taking us from his birth and early studies at Yale College (not much is known about the intervening years) through his career as revivalist and theologian, and to his final post as Princeton’s third president. The third through fifth chapters form the heart of the book, where Gura argues that what animated Edwards’s preaching was an articulation of grace never before laid out in colonial America (though he notes that Edwards’s grandfather, the controversial and influential minister Samuel Stoddard, hinted at this in his own theology). It’s this grace—this “new, simple” presentation of the Gospel—that drew so many to convert after hearing Edwards, and it’s this grace that explains the biographer’s subtitle: In Gura’s reading, Edwards’s grace-filled preaching was the beginning of the great tradition of American evangelicalism. 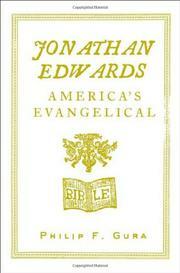 This assertion is sure to spark debate among scholars: the claim that Edwards was an evangelical is no mere semantic move, but a challenge to the theological categories that many historians have long made conventional in the history of American Protestantism. Gura’s study, too, will invite inevitable comparison with George Marsden’s biography of Edwards, which won the prestigious Bancroft Prize in 2004. Marsden is, no doubt, the standard-bearer, and even Gura acknowledges that Marsden’s is “the definitive life,” saying that his own study is not exactly a biography but a “consideration of Edwards,” a “selective” meditation on certain themes in the life. Gura will win readers, too, though, with a work that’s much the shorter, and a forceful argument that’s clear, accessible and arresting. Controversial, and a quick, enjoyable read. Gura will grab at least some of the audience of armchair-history-lovers that professional historians always claim they want to reach.